The optimism of consumers, business owners, and investors continues at high levels despite hurricanes in Florida, Texas, and Puerto Rico, fires in California, and possible nuclear confrontation in North Korea. In past markets, investors also faced similar issues. For some perspective on the relative constant of world issues, let us look back about 60 years to a hit recording titled “The Merry Minuet”. Nearly the same lyrics could be written today. See whether you agree. 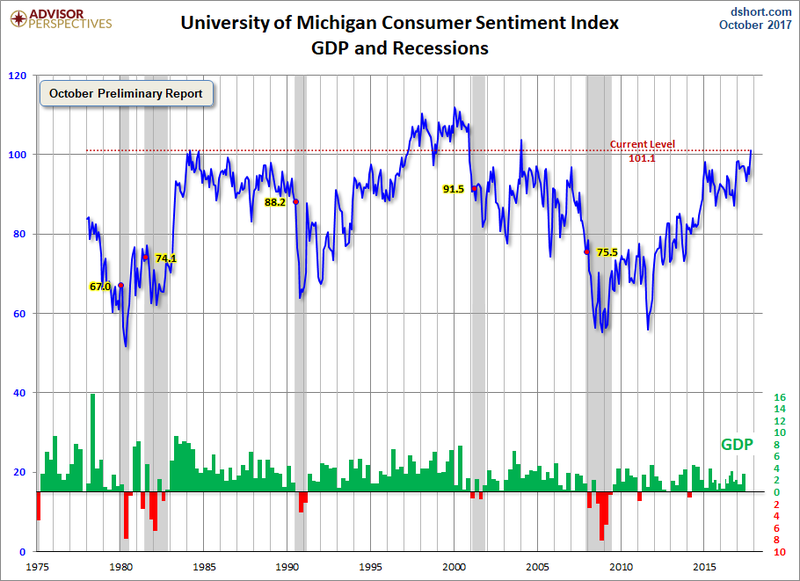 The University of Michigan’s preliminary consumer sentiment index for October spiked 6 points to 101.1. This represents the highest level for the index since early in 2004. For perspective, since its 1978 inception, the index averaged 85.6. Economists at the Michigan survey noted that this outlook suggests the expansion should continue at least into the middle of 2018. They also pointed out, if the expansion continues through the middle of next year that would mark the second longest expansion since the mid 1800’s. By then, in our view, consumers should know whether tax reform legislation passed and weather or not they will benefit. Retailers bought into consumer optimism earlier this summer. Our late August commentary pointed out the first signs of a strong holiday shopping season may be reflected by the strength of container volumes coming into U.S. ports. Container volumes in the summer months reflect inventory building for the upcoming holiday shopping season. Since our August commentary, an additional report provides a similar positive reading. The national retail federation’s “Global Port Tracker” reported imports broke records for the two months ending in August. The volumes represent the highest on record since 2000 when the N.R.F. began tracking imports. Overall, August showed an increase of 5.6% over last August. Of course, consumers will provide the ultimate verdict with their purchases during the holiday shopping season. 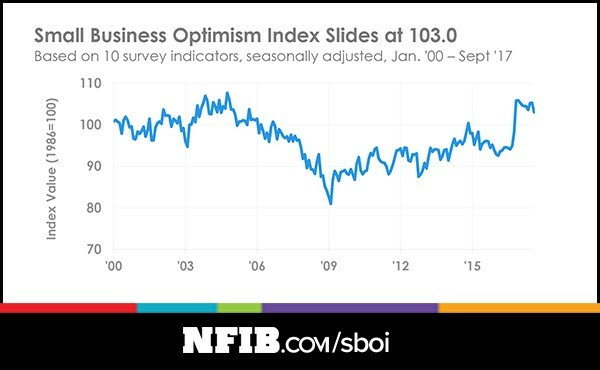 Similar to consumers, small business optimism remains high compared to recent history. The graph below shows their optimistic upsurge began in December, after the election, with a “Trump Bump” of 7 points. Small businesses’ continuing optimism translates into a five point increase in their inventory plans for the fourth quarter when compared to August. Small business optimism can also play an important role in contributing to employment growth. In that regard, the survey showed finding qualified workers represented their second most important problem—after taxes of course. For those who question the strength of the employment recovery this response might reduce their concerns. It may also finally lead to stronger wage increases. Finally, investors take all the issues that face the economy and the global issues identified in “The Merry Minuet” and still come out extremely optimistic. The positive outlook for the economy, as reflected by consumers and business managers, contributes to investor optimism and the resulting strength of equity markets. As important, the positive economic outlook and the strength of the equity markets can also lead to investor “complacency.” The evidence of this “complacency” shows up in the historically low levels for the Chicago Board Options Exchange Volatility Index—the VIX (see graph below.) More specifically, over 75% of the time the VIX closed below 10 occurred in 2017. Just this month the VIX closed at a record low of 9.19 on October 5th. Optimistic investors also expect the current market “complacency” to continue. 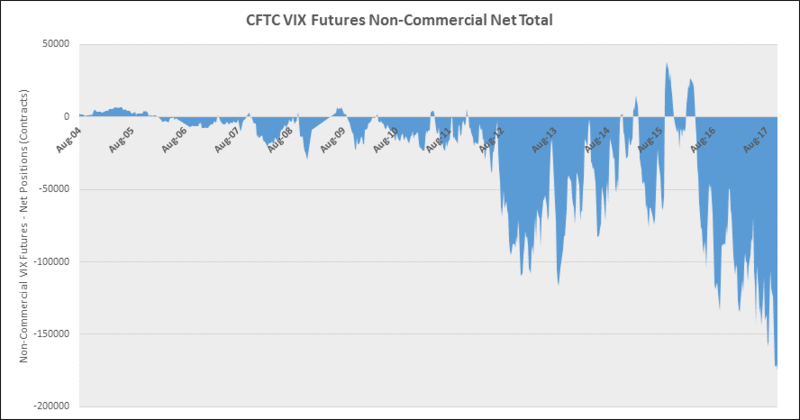 That conclusion shows up in the record VIX futures short position (see graph below.) The expectation for low future market volatility stems from investors projection of continued domestic economic growth as well as a more positive global outlook. Over the last decade, expanding earnings multiples more so than earnings growth played a key driver for the nearly decade long market upswing. In our view, historic low interest rates, put in place by the Fed, helped stimulate this earnings multiple expansion. With the Fed now reversing the switch on monetary policy, interest rates will likely rise over the next two plus years. If so, those higher interest rates could bring downward pressure on earnings multiples. With that possibility, two likely keys to future equity market performance will be both the earnings outlook and the passage of tax reform legislation. This commentary earlier provided some evidence for continuation of the current economic and earnings growth. And, in the case of tax reform, analysis project corporate earnings could increase in the range of 7-12%. By adding this earnings gravy to the already positive earnings outlook, tax reform should help solidify the current investor optimism as shown earlier. Caveat– the cacophony in Washington creates a cloudy picture as to forecasting the eventual enactment of tax reform. Normally, a less accommodative monetary policy influences the economy with a lag of about 12-18 months. If so, over that same period, tax reform may then begin providing the fiscal stimulus necessary to offset the monetary bite. Admittedly, that may be asking too much of the Fed and Congress to, in sync, pull off the equivalent of an economic and financial royal flush. DISCLAIMER: First Capital Advisors Group, LLC is a federally registered investment adviser under the Investment Advisers Act of 1940. Registration as an investment adviser does not imply a certain level of skill or training. The oral and written communications of an adviser provide you with information about which you determine to hire or retain an adviser. First Capital Advisors Group, LLC, Form ADV Part 2A & 2B can be obtained by written request directly to: First Capital Advisors Group, LLC 200 White Road, Suite 215, Little Silver, NJ 07739. The information herein was obtained from various sources. First Capital Advisors Group, LLC does not guarantee the accuracy or completeness of such information provided by third parties. The information in this report is given as of the date indicated and believed to be reliable. First Capital Advisors Group, LLC assumes no obligation to update this information, or to advise on further developments relating to it.This is prepared for informational purposes only. It does not address specific investment objectives, or the financial situation and the particular needs of any person who may receive this report. Definitions: VIX® volatility index futures provide a pure play on implied volatility independent of the direction and level of stock prices. VIX® futures may also provide an effective way to hedge equity returns and to diversify portfolios.